Weather and terrain can be rough on any vehicle and Jeeps are no exception as much as we would like to think otherwise. The molded splash guards for your Jeep Wrangler can help protect the lower body from most road debris such as salt, dirt and rocks. This is a very durable product made out of TPO plastic and TPR rubber. 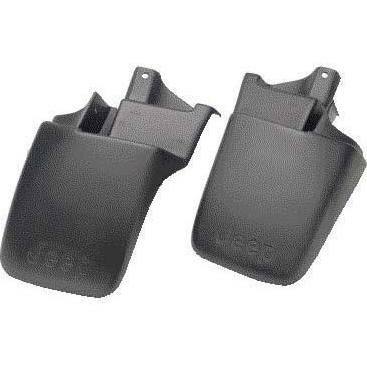 They will help keep your Wrangler from getting dents and scratches from flying objects while you are driving. Not only do the molded splash guards help protect your Wrangler, but they add to it's appearance. The splash guards are molded to fit the Wrangler's contours so you have an expensive custom looking appearance at a very affordable price. Do yourself a very affordable favor by purchasing the molded splash guards. They will help protect your Jeep from scratches and will help protect the overall lower body of your Wrangler while providing an accent to the styling. 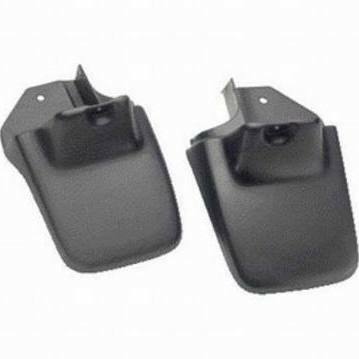 Set of two guards for the front or rear. Black, Front or Rear, set of two. Front cannot be used with tubular side steps. Please select above.